I can’t help but feel that some explanation is necessary regarding this rambling mess you are about to read. I could come up with a lot to say, actually, but what it boils down to is this: I live in Seattle, Washington, and we’re in the middle of the ugliest, rainiest, most depressing winter I have ever experienced! With the absolute lack of flying opportunities, I think I’m beginning to go a bit stir-crazy. This was the genesis for the following essay; an attempt to exorcise my kiting demons deep within. Usually they are kept quiet by constant flying. But without that outlet, my brain begins to run at a thousand miles an hour, and in a million directions all at once. I have changed some names to protect the innocent, and any similarity between actual people, places, or occurrences depicted in this writing to those actually existing are entirely intentional. There!! You’ve been warned. Proceed at your own peril! It all began innocently enough with an off-hand remark from my brand new wife, Karen. 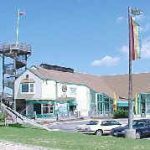 We were on our honeymoon on the Outer Banks of North Carolina, and as we were driving along on our first full day as “Man and Wife,” Karen saw a store she recognized from a family vacation she had taken over a decade earlier. I vaguely heard bells sounding in the distance. Lights dimmed. The question hung heavy in the air and time seemed to slow to a crawl. The universe was compressed into one singular moment in time, and History has been known to turn on such moments. This was my response as best as I remember it, although Karen recalls that she had to do a bit more convincing to get me interested. In any event, because of her suggestion, I was about to be introduced to what has become an all-consuming passion and new favorite way to spend my free time. Part Two – I Want THAT One!!! For the rest of my life I will remember the first time I saw a dual line kite. 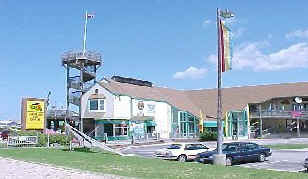 At the time, the kite section of Kitty Hawk Sports was in the upstairs loft area, and had an open stringer staircase leading up to it with a right hand turn about halfway up. From this landing you could see onto the sales floor. The kite was the Eclipse, and the kite company, Prism Designs. All of these coincidences would turn out to be very important to me, as we will see later. I’m sure I nodded my head and muttered something non-committal. 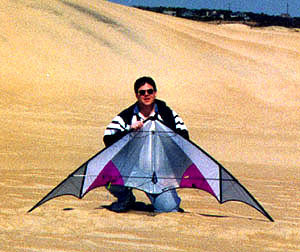 I then grabbed by blushing bride, my new gear, and headed out to the nearest dune to fly. I was sure that the wind couldn’t possibly be blowing THAT hard, and besides, I REALLY wanted to give it a try!! I stumbled back into the shop about an hour later. If the response of my Kitty Hawk Kites Salesperson was any indication, what happened in that first flight would enter into North Carolinian folk-lore and would be re-told to frighten small children for generations to come. I felt strange about it from the beginning, but stumbled forward out of a sense of my own personal righteousness. I must be able to do this. How hard could it be? Eventually we got the kite together and all hooked up to the lines. Karen was acting as ground crew for this, our first attempt at flight. As she stood at one end of the lines holding the kite to the ground and I stood at the other with the straps dangling loosely from my wrists, I was suddenly struck by just how far 150ft really is. I should have realized at this point that the winds were too high, in that I could barely see the kite through the blowing sand. I was also having trouble shouting over the howling of the wind, so communication between Karen and me wasn’t all that great. I want to take a moment to paint for you, gentle reader, a mental picture. There we were, two supposed adults, out in gale force winds about to try to fly a dual line kite. I had NEVER flown one before. Neither had Karen. We were truly the blind leading the blind, due to all the sand in the air, and I had only the vaguest notions of how to control the kite under the best of conditions. Karen was having a hard time just keeping the kite on the ground. It kept shaking and shuddering violently. Its rods were flexing all over the place, and I was still trying to figure out which line was on the left or the right. Every time I looked up, Karen was wrestling with the kite, and not winning by much. Even in the face of all this, I began to feel optimistic!! I felt that once into the air, all the pieces would fall into place, and I would zoom and swoop majestically over the dunes to the envy of all who could see! Well, as someone once said, “the truth hurts, don’t it?” When I had finally figured out my left from right, gotten the assembled kite into position, and worked out the launch signal with Karen, we decided to go for it!! The end results looked more like something done by Jackson Pollack than Michelangelo. Remember the shuddering and shaking kite barely kept on the ground by Karen? Well, all she had to do was move her hand back half an inch, and it tore into the sky like a rocket, knocking her over and damn near pulling me across the sand!! My heart turned to stone! I was in over my head, and I now knew it! I had no idea whatsoever what I was doing. Straight up it flew, up, up, even higher, until my neck was all the way back and I thought I was about to topple over. It sat there, directly over my head, not moving much, just bouncing around a bit in the swirling wind. My heart started beating again. This wasn’t so bad! I can handle this, just pull with the left to go to the left, and then with the right to go to the right. No problem! I decided to try actually doing something, just a little tug on one line and… BIG MISTAKE! I still don’t know what happened. One moment the kite was over my head, and the next, my wife was screaming and diving for cover as my brand new, very expensive kite dove into the sand. And I mean “into” the sand. By at least six inches! I don’t know if carbon kite rods are self-aware or not, but the rods in my kite definitely howled a death scream as they shattered into many splintery bits. I lost both of the upper leading edges, both lower spreaders, one lower leading edge, the spine, and the upper spreader. The only surviving rod, one of the lower leading edges, had to be put down out of concern over a possible hidden stress fracture. The only good news from this entire affair was that no damage was done to the sail, which surprised the young man that had the unenviable task of piecing my ruined kite back together. To their credit, the folks at Kitty Hawk Kites fixed my kite for me, free of charge, on at least three separate occasions that week without so much as a word of condemnation for my lack of care with my new purchase. They were a big help in explaining to me some of the basics of controlling a kite, and especially helpful in explaining what to do if you’re about to crash so that you minimize damage. By the end of my visit to North Carolina, I had succeeded in several things. I had begun a life as a married man. I had found a new hobby. I had had a very good time. As far as kite flying goes, I could now keep the kite in the air for a bit without endangering too many of the indigenous life forms of the area. I could land at the edges of the wind window. (I also knew what the wind window was.) And flying pointing down didn’t scare me to death anymore. Not too shabby! 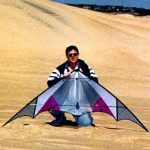 As I prepared to leave town and return to Seattle, I could have had no idea what was in store for me in regards to kiting. I had just started on a road that would take me many places, and cost me a chunk of change, all to pursue a hobby revolving around… yes, you heard me, kites! This entry was posted in Issue 8 (Mar/Apr), Kiting Experience and tagged stunt kite.